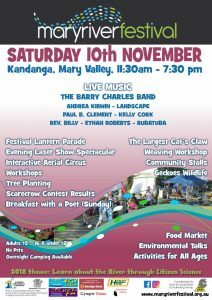 There are ten more days left of the Scarecrow Festival before the Mary Valley Festival, 11.30am-7.30pm, on Saturday November 10 at the Kandanga Community Reserve (behind the Kandanga Hall). The festival is a family-orientated community event run by a group of dedicated local volunteers. Expect loads of children’s activities which will be focused around art, creativity and learning about what’s special about the Mary River. 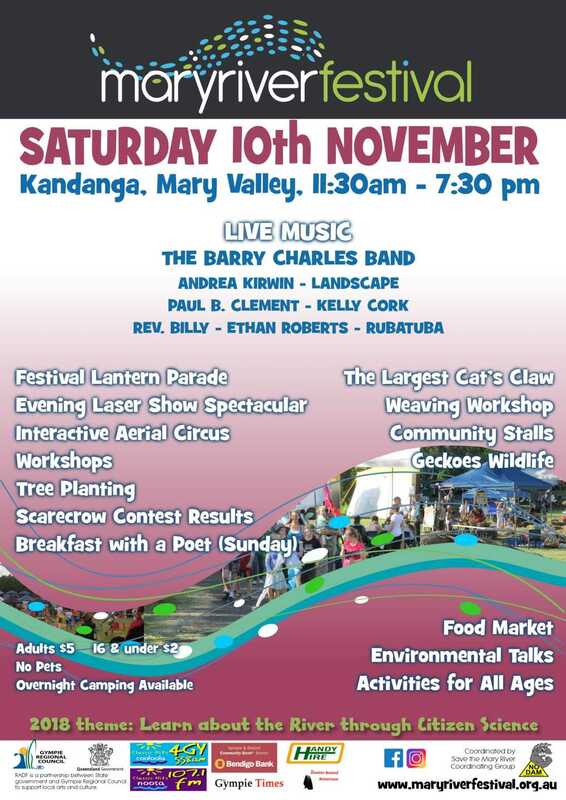 The Yabba Yarning Speakers tent will entertain and educate the audience with people and their stories around Citizen Science projects in the Mary River catchment. “We have been fortunate to get an RADF grant that have helped get some great cats claw weaving workshops leading up to the festival. Then we will aim to have the largest cats claw weaving workshop ever on the festival day between 2.30 and 3pm,” said Glenda. Terry the Great will be back in his lab coat, performing circus things that only Terry can do so well. The final event will be a laser show masterpiece from our local artist/producer, Bruno Kempter. And to see more scarecrows at the scarecrow festival – travel country roads looking for straw creatures, arty sculptures and other creations honouring the tradition of building scarecrows. There’s a map to lead you to discover new places, and it’s a great excuse to pack a picnic and tour through Mary Valley Country.